Move over rice cakes and boring toppings. 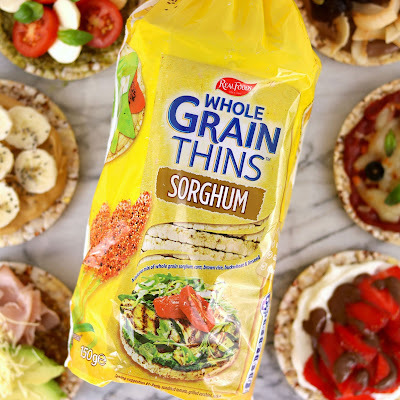 Shake up your lunch or afternoon snack with Real Food's Whole Grain Thins™ Sorghum and these 6 delicious topping ideas. This post is sponsored by Real Foods, however, all recipes and opinions are entirely our own and this is a brand we genuinely love and buy ourselves and confidently recommend to you! I hated sandwiches as a kid.... so my poor Mum was constantly trying to come up with lunchbox ideas that I'd eat. Soggy sandwiches were a no go, but crunchy crackers with different toppings were a hit - and Corn Thins were my favourite. When I first found out I had coeliac disease, Corn Thins were one of my favourite foods that stuck. They were gluten free and the perfect lunch option for the person that cried over gluten free bread (because it was awful at the time) and so much cheaper too. But lately, my old favourite has had a little bit of a makeover - and there's a new favourite in town. 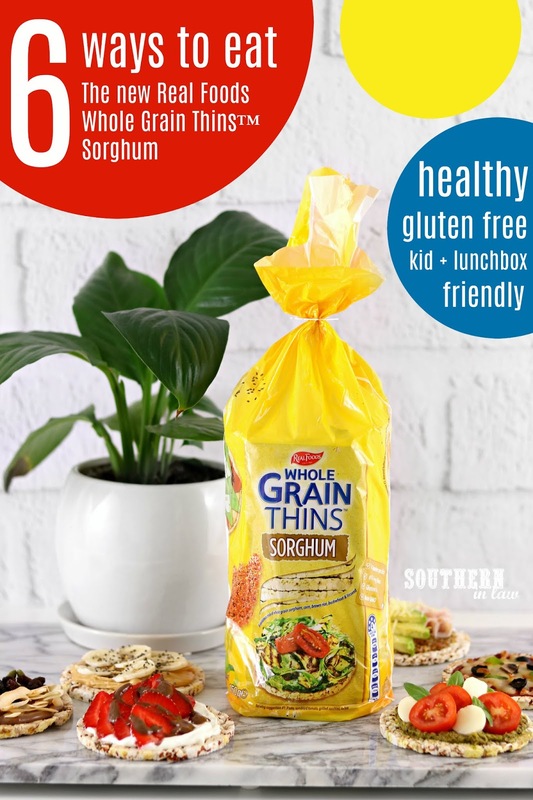 Real Food's Whole Grain Thins™ Sorghum combine everything you love about Corn Thins and add the goodness of sorghum - an ancient gluten free grain that's non-GMO and full of protein, fibre and nutrients. Click here to pin this post on Pinterest! It's believed that the consumption of sorghum is associated with a decreased risk of developing cancer, obesity, cardiovascular disease and high cholesterol - and it's also great for improving digestive health, bone strength, immune function and diabetes management. Best of all, unlike many health superfoods, sorghum actually tastes really good. It has a mild nutty flavour that works really well with the brown rice, corn, buckwheat and linseed used to make the new Whole Grain Thins™ Sorghum. 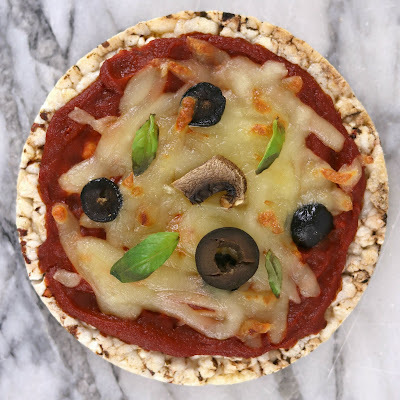 Whilst we totally eat these whole grain thins on their own, I thought it would be fun to share some unique topping ideas. These are toppings we've experimented with and loved - and I think you'll love them too! 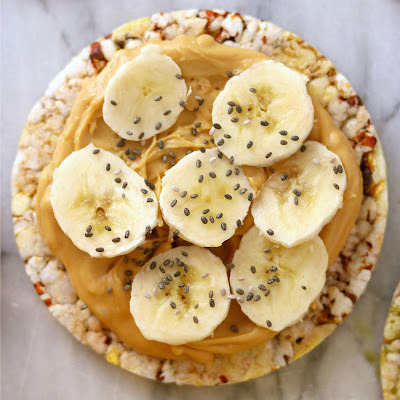 Can you ever go wrong with peanut butter and banana? I vote no! This is one of our most eaten toppings. Peanut butter is a favourite in our house, but it also works perfectly with almond butter, cashew butter or sunflower seed butter for a nut free option. If you want an extra sweet treat, add a drizzle of honey on top. Lunchbox Tip! Pack some Whole Grain Thins™ Sorghum with a little container of sunflower seed butter (or an allowed nut butter) and banana in your kiddos lunchbox and let them make their own crunchy "sandwiches". This is a more grown-up topping combination! Spread your Whole Grain Thins™ Sorghum with homemade or store-bought basil pesto and top with sliced tomato and bocconcini balls. Lunchbox Tip! Want something different for a work or school lunch? Slice your tomato and bocconcini and place in a container. 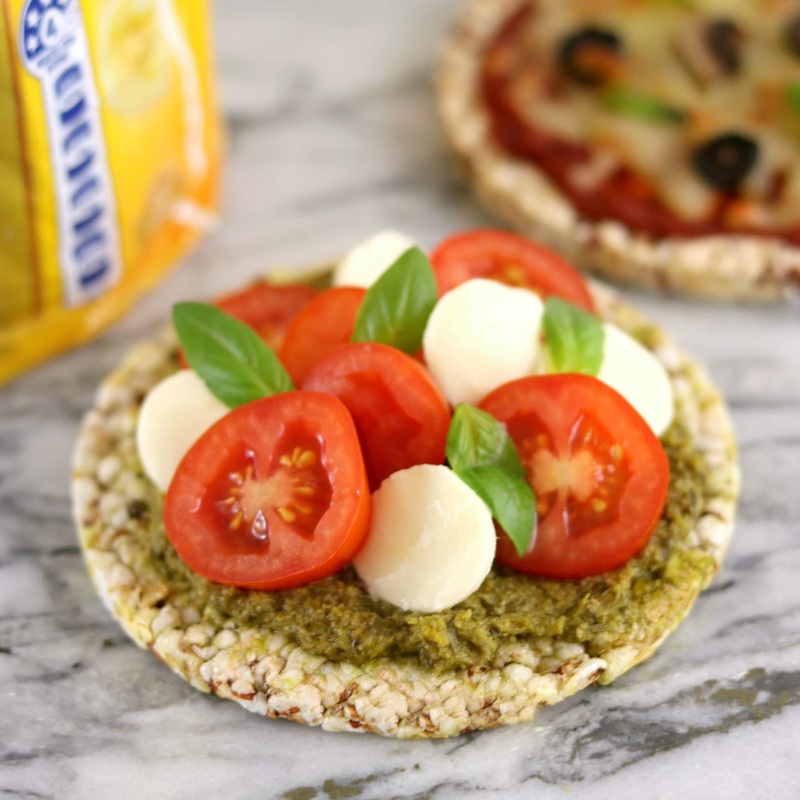 Add a little container of pesto and some Whole Grain Thins™ Sorghum and you're ready to assemble your lunch later on! Because this one involves chocolate, it's guaranteed to be a hit. 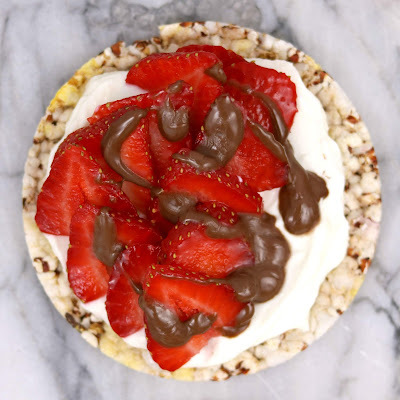 Spread some Whole Grain Thins™ Sorghum with spreadable cream cheese, top with fresh strawberry slices and drizzle with melted chocolate or Nutella. Add a little extra fun! Encourage your little ones to eat more fruit by letting them build their own "fruit pizzas". Put together a platter of slice fruit and let them assemble their fruit pizzas themselves. These also make a great healthy dessert option and you can switch cream cheese for yogurt if you prefer. Another adult friendly fave. 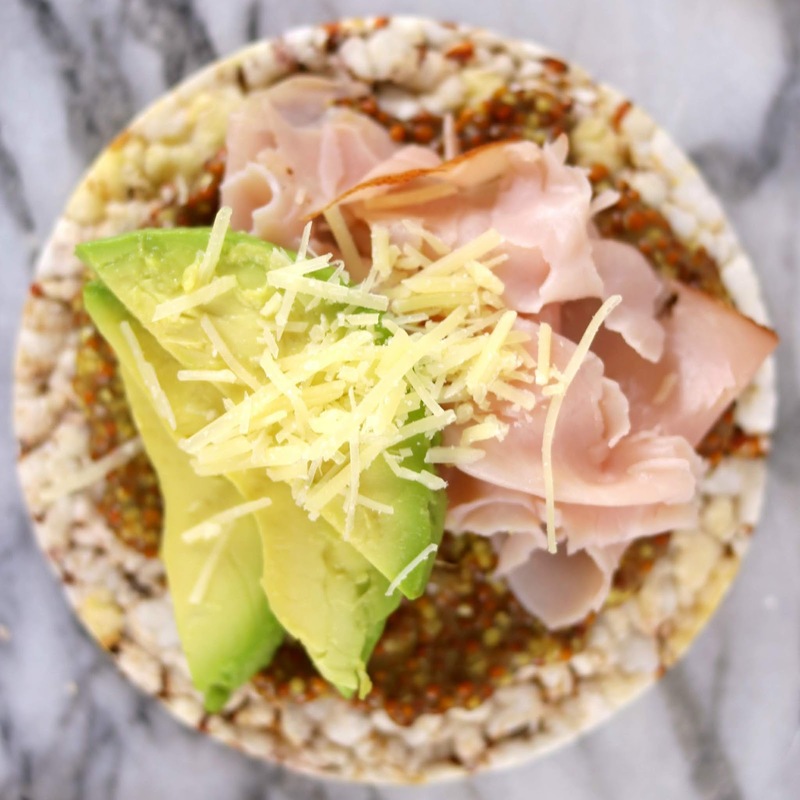 Spread your Whole Grain Thins™ Sorghum with some wholegrain mustard and top with ham, avocado slices and a sprinkle (or slices) of cheese! Lunchbox Tip! This is a great lunch option - but to ensure they don't get soggy, pack everything separate bento box style and assemble when you're ready to eat! I have a Planetbox Rover which perfectly fits the Whole Grain Thins! Again - chocolate = crowd pleaser, but this topping also adds some sneaky nutrients. Not only are the whole grain thins packed full of nutrients, the toppings are too! 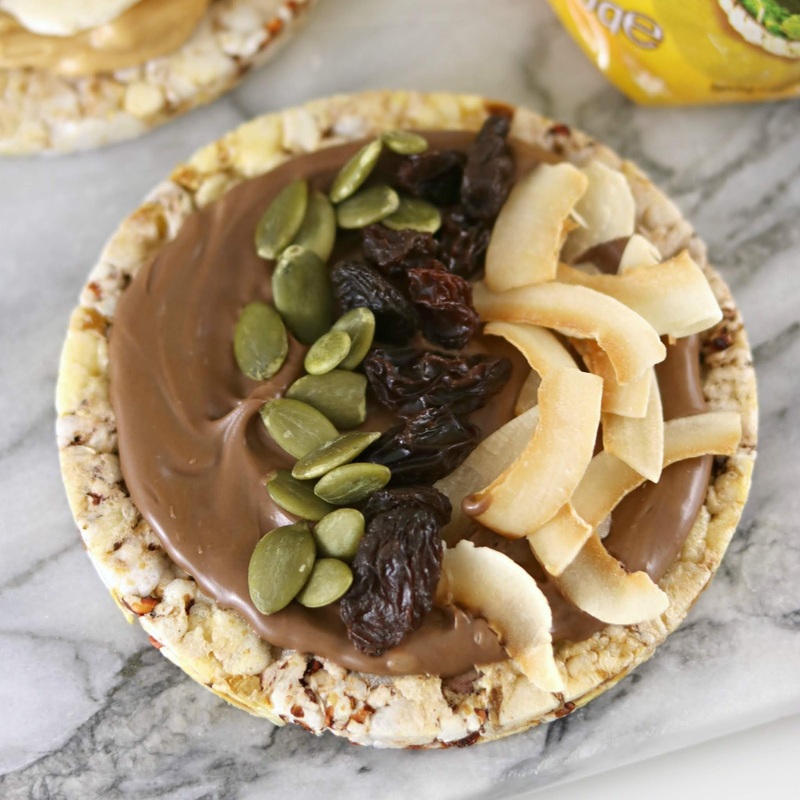 Spread a thin layer of melted chocolate onto the top of your Whole Grain Thins™ Sorghum and sprinkle on nuts, seeds, dried fruit, coconut or whatever you fancy. Leave to set at room temperature or in the fridge and enjoy! Add a little extra fun! Let your kiddos make these themselves. Add the chocolate (because let's be honest, they'll probably dump the whole bowl on one cracker if given the chance!) and let them add the toppings. You can also add fresh fruit if you're eating them straight away. This is Jesse's favourite (because he is a pizza fiend). Top your Whole Grain Thins™ Sorghum with a thin layer of pizza sauce (we used pureed tomatoes, seasoned with salt, pepper, garlic and herbs) and add cheese and pizza toppings. Place into a preheated oven (180C/355F) and bake just until your cheese is melted. Enjoy immediately! Add a little extra fun! This is a great afternoon school snack. Let the kids assemble their own and bake away! They will get a little soggy if you leave them to cool so they're best eaten hot from the oven! Wondering where you can buy the new Real Foods' Whole Grain Thins™ Sorghum? You'll find them at your local Woolworths store for $2 a pack! What topping would be your fave?! And what's your go-to snack at the moment? Whilst I love these toppings when I have a bit more time, I also love these Whole Grain Thins with mashed avocado and a sprinkle of salt. Simple, quick but so so delicious!